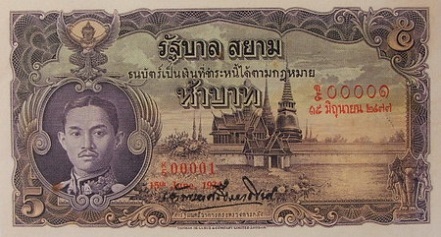 Ordinary number signature Phraya Sri EF about 43,700 - 45,800 baht. Ordinary number signature Phraya Sri VF about 35,500 - 37,200 baht. Ordinary number signature Phraya Man VF about 12,400 - 13,000 baht. 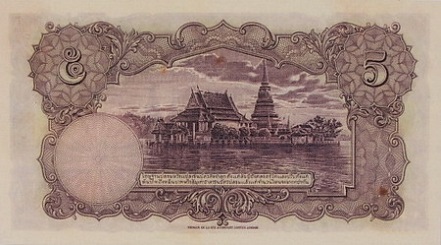 The 3rd series 5 Baht type 1 banknotes were announced on 22nd November 1934. The main object is the image of King Rama 7 on the left. The middle image is the Emerald Bhudda Temple at the Grand Palace. The serial code and number were printed with red ink. The date of banknote was printed in red under serial number.